With the bustle of tests, homework, and extracurriculars, it’s often easy for students to get lost in the “Tech bubble.” On Sept. 11, however, several students on campus took a moment to take a break from their usual school routine to honor the 12th anniversary of the 9/11 attacks. The precursor to the memorial event began the day before when 3,000 small American flags were placed along Skiles walkway. Representing the 2,977 lives lost as a result of the attacks, these flags were part of the Never Forget Project, a national campaign that encourages students across the country to honor the attack’s victims through public displays and memorial services. Tech first became involved in the project ten years ago, when two of the school’s students, Ruth Malhotra and Orit Sklar, noticed that the school had nothing planned for the second anniversary of the attacks. Concerned with the lack of remembrance on campus, the two students contacted the Never Forget Project. Since then, Tech has been an active participant. This year marked Tech’s tenth anniversary as a participating member. Beginning at noon on Wednesday, Sept. 11, students, faculty and staff members from all over campus convened around the campanile to honor and remember victims, their families and those affected by the event. A mixture of solemn moments, deep silences and expressions of patriotism equally blended to bring tears to the eyes of numerous students within the audience throughout the various speeches and singers. The event began with a performance of the national anthem by a third-year Tech student and Miss Cobb County winner, Maggie Bridges. The crowd rose to their feet and sang along, creating an atmosphere of patriotism that remained strong throughout the event. Second-year BA major Ashley Wiser followed the opening song with a brief speech regarding the status of the One World Trade Center grand opening in New York. The memorial was described as a “beacon of freedom” and is set to open on Ground Zero, with an observational tower also opening later. After much debate over what to do on the land of Ground Zero, this long-awaited dedication is set to open in the spring of 2014. Following the excerpt was the event’s keynote speaker, Colonel David Dodd, a veteran of the U.S. Army. Dodd’s speech focused on living a life worthy of the sacrifices the fallen made for the remaining, drawing many parallels between the event and his Christian faith, drawing directly from Bible. Regardless of religion, all members in the audience could understand what Dodd was telling them; nearly 3,000 men and women gave their lives on that fateful Tuesday so that the rest of the nation could continue on with theirs. 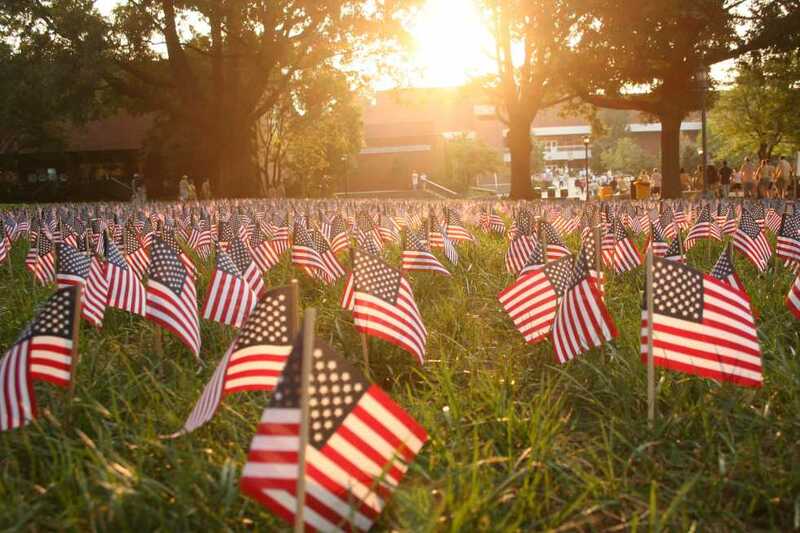 As those standing in the audience reflected on Dodd’s ending words, Bridges returned to the podium in order to sing a chilling rendition of “God Bless America” as the sun shone across Skiles Walkway and highlighted the beautiful rows of American flags in the nearby grass. A few parting words were then said as the event came to an end. Audience members made their way to the bottom of the Campanile steps to take “Never Forget” pins and dog tags back with them as daily reminders. There was also an opportunity to sign up to sponsor a soldier currently deployed on active duty. The entire project, which was endorsed in large part by the Office of Student and Diversity Affairs, along with the Tech College Republicans group, was the only Sept. 11 memorial event held within the entirety of Midtown. Although the majority of the population in attendance was comprised of Tech students, the event was actually opened to any and all that wished to attend. Though it would seem easy to forget about the tragedy since so many years have passed and so many students were very young at the time of the attacks, students across campus nevertheless understood the importance of taking a moment from their busy weekday to honor, remember and truly reflect. First-year BMED major Clare Botti elaborated on her feelings regarding the memorial, although she would have only been in the first grade at the time of the attacks. “It’s our duty as Americans to remember those who have fallen and it’s important to remember those whose lives were changed because someone they knew or loved lost their life defending our country,” Botti said. This year’s event coordinator was second-year ME major Rachel Witt, who is involved with the Tech College Republicans organization and is particularly passionate about remembering the important moment in our country’s history. After running strong for 10 years, Tech will likely continue their tradition of memorializing those lost, celebrating our nationalism and remembering the significance of 9/11 within our country’s history.